Choose Your Website Theme and Design! With fourteen different themes to choose from, you are sure to find one that meets your note business objectives and personality! You also get to select the photos and have us add your existing logo to make the site unique. The good news is that you can’t make a bad pick! 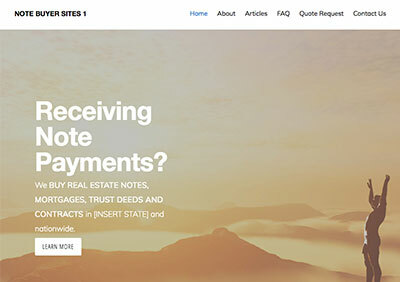 Every theme comes complete with pre-loaded content and articles, FAQ’s for note sellers, and even a complete Note Submission Worksheet right online! Special Note: Themes 1 through 3 and themes 6 through 14 all use mobile responsive design while themes 4 and 5 are fixed width. If you want to learn more about mobile responsive design please visit our FAQ page. Click any of the images below to open a site in a new window for a LIVE preview! CONNECTION - (Theme 14) - Inspire visitors to connect online! An eye-catching call to action encourages scrolling through the storyboard layout. Making a connection is easy with a built-in contact form on the home page and colorful contact info at the bottom of every page. The Connection Theme is mobile responsive, integrates with social media, and provides unlimited color options for easy customization. FOCUS - (Theme 13) - Remove distractions with streamlined design! A generous use of white space on the home page keeps visitors focused on your message. 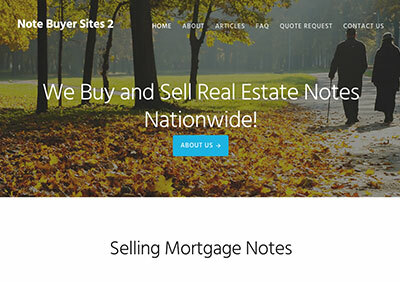 This clean look extends to interior pages utilizing a single column (no side-bar) layout. The Focus Theme is mobile responsive, integrates with social media, and is available in 5 colors including Green, Orange, Red, Black, and Blue (shown). STORYBOARD – (Theme 12) – Tell your story in a narrative style with a modern visual look. The simple vertical design of the Storyboard theme lets you share information in a natural flow that positions your services as the solution.The mobile responsive design looks great on desktops, tablets or smart phones. Select an accent color, add your logo, and use different photos for a completely custom look! Available in Blue, Green, Orange, and Red. ASSURANCE – (Theme 11) – Let people know you are here to help with the professional and clean lines of the Assurance theme. With a contact form right on the home page and your phone number in the header you are just a call or click away.The Assurance Theme is mobile responsive, integrates with social media, and can be customized to match your logo (or use the default blue/teal logo provided). BLOG ROLL – (Theme 10) – Put the focus on your content! The Blog Roll Theme features the most recent posts and articles from your blog right on the home page. This site combines mobile responsive design and social media icons with the look and feel of a traditional business blog. PERSONAL – (Theme 9) – Make business personal! The modern design of the Personal Theme uses friendly images to make your business approachable and accessible. Want more personalization? Customize with your company logo or photos for a unique look.This theme is mobile responsive, integrates social media icons, and is available in 5 colors including Green, Orange, Red, Teal, and Blue (shown). PROFICIENCY – (Theme 8) – The Proficiency Theme is a slick new page-based theme that is great for anyone wanting to give their website a clean and professional look. If you are looking for a simple and elegant layout that is also Mobile and Tablet friendly, then Proficiency is the theme for your note business. NEWS – (Theme 7) – News is a theme with two simple goals. Educate the potential client and have them get a hold of you…quick.Your contact info and any social media accounts are quickly at someone’s fingertips (or is that “mousetips?”) – Great theme for adding or featuring a variety of articles or topics. This site is also mobile responsive and will automatically adjust to the visitor’s screen size.Available in 5 colors including Red, Orange, Teal, Green, and Blue (shown). RESPONSIVE – (Theme 6) – How nice would it be if all things were as attentive and adaptable as the Note Buyer Sites “Responsive” theme. This site actually adapts to the screen size the user is on.Someone checking out your site on an iPad? No Problem. A Smart Phone? No problem. Oh, and of course it still looks great on an “old school” computer screen (of any size)!Available in seven colors including Brown, Green, Orange, Purple, Red, Teal, and Blue (shown). ENVY – (Theme 5) – Let’s not forget this is a people business and “Envy” does just that. A great site with extra large photos leaves the visitor with a “people person” impression. This theme is also available in Blue, Gray, and Maroon. With a name like “Envy,” we had to showcase the Green. EDUCATION – (Theme 4) – Our most robust site, “Education” hits the visitor with the impression of solid content. This theme also supports a unique “email us” widget right on the home page. Executive. – (Theme3) – Let us get down to business! Set a professional tone from the start and put potential clients at ease. With your contact information above the header, there is never a doubt about how to get in touch. The Executive Theme is mobile responsive, integrates with social media and provides unlimited color options for easy customization. STREAMLINE – Theme 2 – Make Users Feel at Ease! This theme offers a warm and inviting design, putting your user’s needs first. With social media and contact information on the homepage, this theme is all about connecting with potential clients. The Streamline Theme is mobile responsive, integrates with social media and provides unlimited color options for easy customization. SLEEK – Theme 1 – Put Your Best Foot Forward and Get Down to Business! This sleek design cuts out the distractions, giving users the information they are looking for right away. The Sleek Theme is mobile responsive, integrates with social media and provides unlimited color options for easy customizations.